I can sometimes be a bit slow on the old review lark… I get excited about a new product and throw myself into full-on playing, sniffing, painting, daubing and general testing but it has come to my attention that I’m not a conveyer belt of product analysis. Like every other human being on this planet. I’m fallible and I didn’t see this one coming. Well, I kinda did because I gushed about it to a friend 6 weeks ago. She had also tried it but didn’t like it and her impressions made me doubt my gut instincts, so I cooled my passions a little and tried to inject a touch of devils advocate into the situation. Receiving gratis products to play with and review is undoubtedly completely awesome but with it comes a degree of responsibility in not wanting to let anyone down by being anything other than ‘spot on’ with my reviews. With that in mind, I’d been mulling over the results I wasn’t sure I was seeing… at odds with the simple truth that I loved how the product applied/felt/moisturised etc. But then I saw a before/after photo that wasn’t even relevant to the product I’m talking about and my doubts were blown sky high. 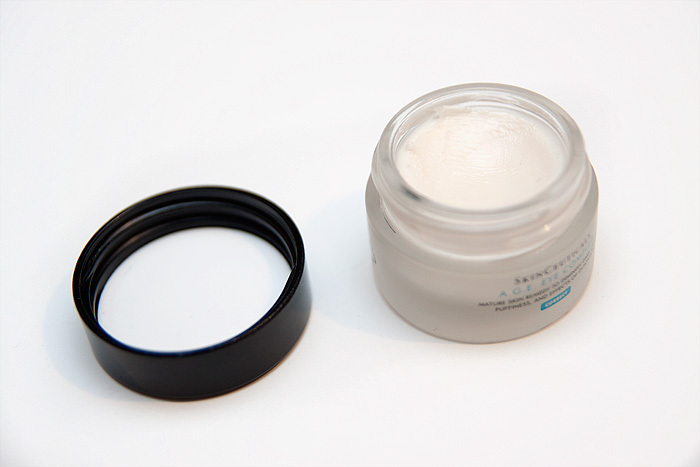 By now, you probably know I’m rabbiting on about the eye cream I mentioned on Friday. A couple of you pointed out that you could detect a visible difference and in a world of disappointing anti-aging products that claim to offer the world, a visible difference (even slight) is a little beacon in the night. …Immediately, optical diffusers improve radiance and minimize the appearance of dark circles and capillaries. Within four to twelve weeks, a complex of flavonoids and synergistic peptides improves lymphatic drainage and eliminates accumulated hemoglobin’s colored degradation end-products to dramatically improve dark circles and puffiness. By twelve weeks and beyond, blueberry extract interrupts the formation of advanced glycation end-products (A.G.E.) and Proxylane restores water and nutrient content to the dermal epidermal junction (D.E.J.) to increase skin elasticity and thickness for dramatic improvement of wrinkles and crow’s feet. Well now that I’ve managed to baffle myself with the science-y bits… let me tell you the things that I do understand about this eye cream. It’s intensely hydrating without being heavy or too rich and I haven’t experienced any problems with milia since using this. I began testing it at a time when I was very dry under my eyes, scaly dry even. 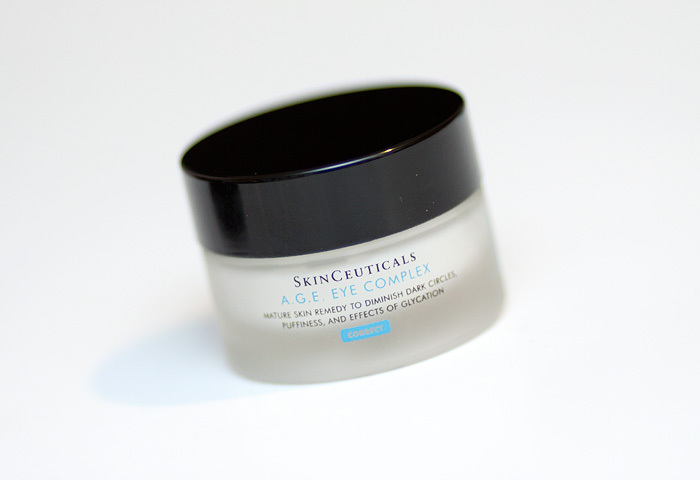 The Skinceuticals cream took charge immediately and within a matter of days my skin was back to normal. 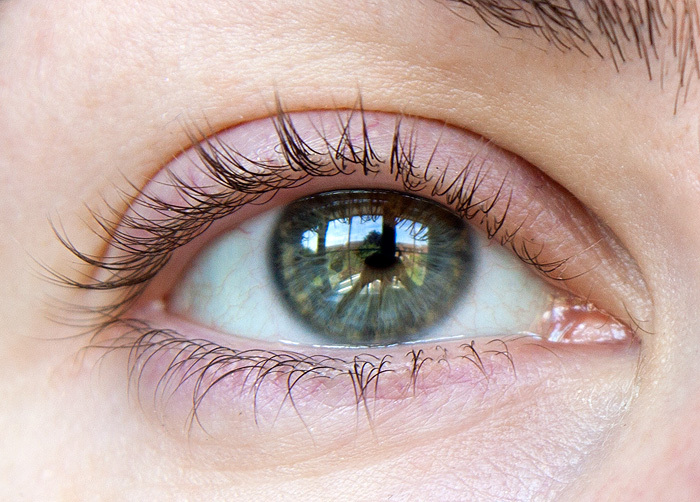 Within a couple of weeks, I felt that the shadow around the edge of my eye socket had a lifted a little but I wasn’t 100% sure if I was imagining it. As for fine lines or crepiness? Well, I didn’t notice any differences at all. To my mind, my eyes look less puffy and the fine lines seem shallower (particularly the one on the right) in the 2nd photo. 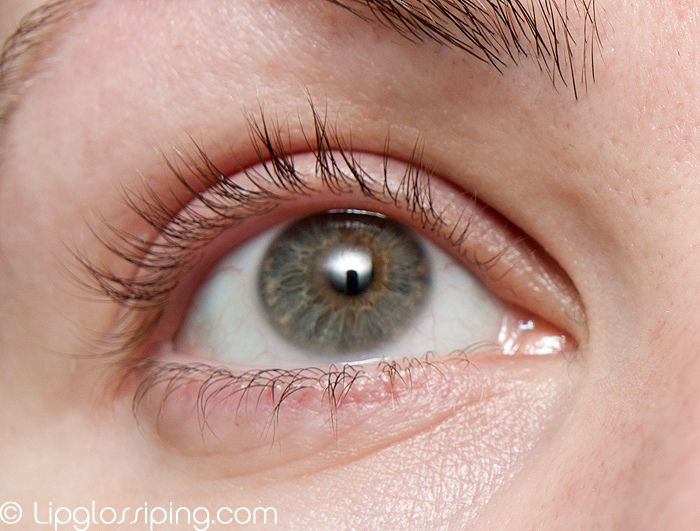 OK, it’s not groundbreaking… it hasn’t erased all imperfections or tightened up any droopiness on my eyelids. Neither is this a hugely scientific experiment but I’m TOTALLY feeling vindicated in an “Oooh I knew I liked this product for a reason!” kinda way. I’ve been using SkinCeuticals A.G.E Eye Complex for around 11 weeks (once a day) and I estimate that I’ll be finishing my pot in around another 8 weeks. I’m currently undecided about a repurchase. If it were £30/40 cheaper, I’d be on it like a recovering alcoholic on a Lambrini. But let’s wait and see what another 8 weeks bring… if it makes my undereyes smoother than a baby’s bum, I’ll be sure to let you know about it! 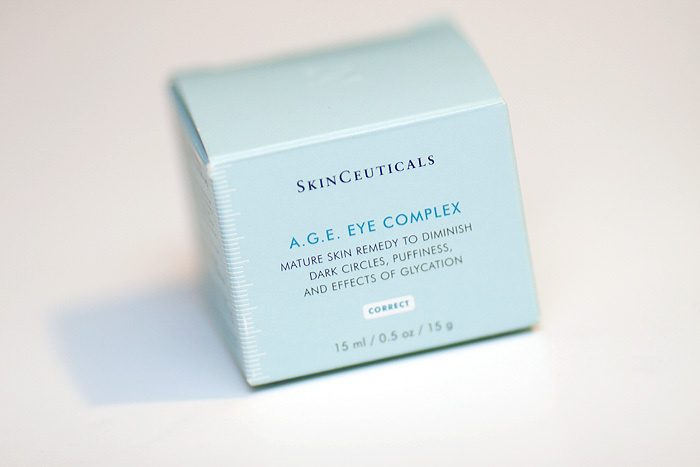 Skinceuticals A.G.E Eye Complex is priced at £78 and available to buy online from BeautyExpert. Is it kind of balm like? It looks like it might be a solidish balm? If it is, I’m definitely buying it. I love that texture for eye creams, and I can see the difference in the hydration levels of your skin (and therefore the lines). The cream does look like it has done you some good, which you would certainly hope with that price tag!! That’s a huge improvement. You’ve found a gem! When good hormones go bad. My quest to smell like a man! Autumn... the year's last, loveliest smile.